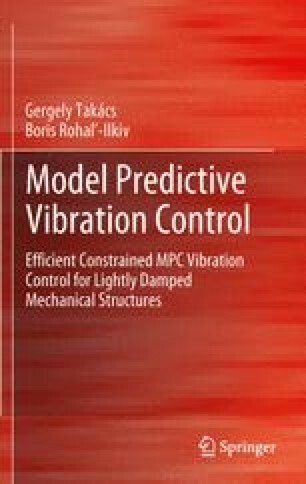 A laboratory demonstration hardware for the verification of model predictive control (MPC) algorithms in active vibration control (AVC) is introduced in detail. The laboratory device featured in the experiments comparing model predictive vibration control algorithms is a simple clamped cantilever beam with piezoelectric actuation. Despite of its elementary physical construction such a lightly damped vibrating device models the dynamics of a class of real-life applications, such as helicopter rotor beams, wing surfaces, antenna masts, manipulators and others. After a brief summary of this laboratory device, its experimental identification procedure is discussed. Some of the characteristic properties of the device are introduced as well, such as actuator linearity and noise tolerance. As finite element modeling (FEM) of vibrating structures is a valuable tool for the engineering practitioner, some of the results of the preliminary FEM analyses performed on the device are also presented. The chapter is closed with a section on hardware component details, which can be an aid to those who are unfamiliar with the components of such AVC demonstrators and are planning to build one.